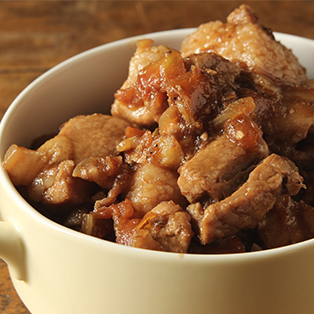 This Filipino pork recipe is easy to do: pork is sauteed and stewed in shrimp paste (bagoong). Use bagoong alamang for this recipe which has a thick, rich paste (as opposed to other kinds such as bagoong Balayan which has a smoother texture than bagoong alamang). Tomatoes add fresh, tangy notes to this savory-salty dish. It’s definitely better eaten with rice. Also called Binagoongang Baboy, this dish may also be served with steamed eggplant and green mangoes. It’s effortlessly packed with flavor and is perfect with loads of steamed rice. Heat oil in a medium-sized pan. Render the fat from the pork belly, saute until a bit browned. Add garlic, black pepper and onion saute for 5 minutes then add the tomatoes. Pour in the shrimp paste and saute for 5 minutes. Add the vinegar and let it simmer for 5 minutes. Add water and let it boil until the liquid has decreased by half. Check for the tenderness of the pork. Add sugar and adjust seasoning (if needed) and let it simmer again for 5 minutes. Best served warm with rice.